Craig Byrne and Shilo Adams take a look at ABC's 2015-2016 lineup. Our analysis articles about the new Fall 2015-2016 TV schedules continue today with ABC, who earlier in the day announced when their premieres will be happening. Visiting these new lineups, while referencing our schedule predictions from last month, are Shilo Adams and Craig Byrne. Let us begin to explore the schedule that Paul Lee will call a “four-quadrant” success! CRAIG: I think you deserve some points for having Of Kings and Prophets on Sunday night, even though ABC changed that plan. 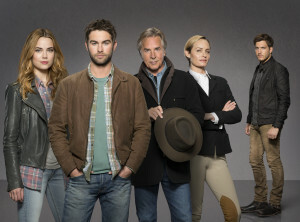 I still think the notion of running it AFTER Blood & Oil, in the 10PM slot, was kind of ridiculous, and I think the midseason plan of The Family at 10 is the best choice for that spot, if they’re not going to move Nashville to Sundays. BUT ANYWAY. I’m fairly okay with the schedule as it is now. Blood & Oil just needs the right people watching and I think it’ll be fine. Quantico was probably a better Tuesday night show, but I’m not Paul Lee, so I can’t tell you how or why they came to that choice. SHILO: I understand why ABC wants to be so aggressive on Sundays. CBS has given up on making the night work as anything but a syndication factory and FOX targets a completely different demographic, so the lane for the next big broadcast show on Sundays is wide open. I just don’t know if these are the shows ABC needs in order to make this move; Of Kings and Prophets was the closest thing they had to a compatible show for Once Upon a Time and it is apparently awful, given the original 10:00 time slot, the trimmed episode order, and the imminent recastings. Blood & Oil will have to hope that Once catches a little bit of that Frozen fire that helped it last fall, otherwise it feels like a show too slow and muddled to become ABC’s next Sunday anchor. Quantico, meanwhile, is a show right in line with what’s been working for ABC dramas lately, so naturally, they bury it in one of the most difficult time slots for broadcast shows and give it an unproven lead-in.